This picture was taken at the 2012 NOPI Nationals. NOPI featured my car at the NOPI Chic booth. The crowds were in love both with my car and the NOPI Chic on the hood. Or possibly just the NOPI Chic. These ladies could not wait to meet the incredible guy that drives this high end muscle car. I would love to say that the meeting turned into a wild carnal night of hedonistic pleasure, but the reality was they were cold and my cars engine was still very warm. Front 3/4 view with updated paint and graphics. 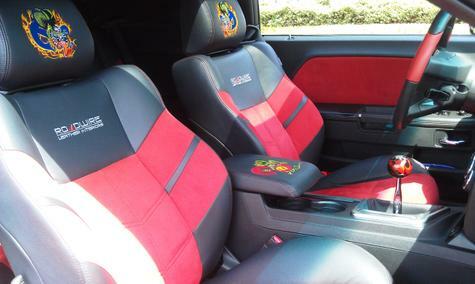 Here you can see the embroidary on the headrests as well as on the center console armrest. 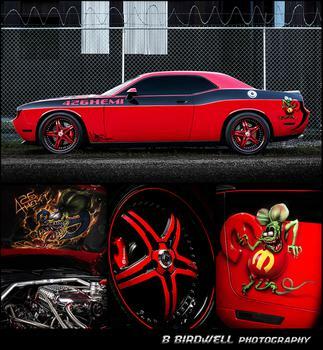 Ed BIG DADDY Roth would be very proud of this car. 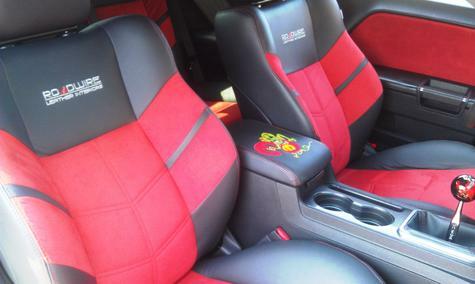 This is how I treat my car. Just the way a performance car should be treated. And yes, I did have to buy new rear tires after this photo shoot was done. New hood paint and graphics. All air brushed. 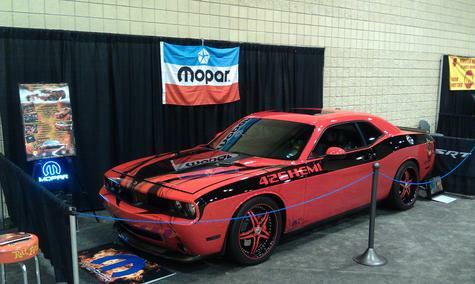 Here is my car at the 2010 World of Wheels car show at the BJCC. The woman is WWE Diva Maria. She loved the car and took many pictures with it. She said that the red was her favorite color. This woman belongs in a muscle car! She had a body that only countless hours in a gym could produce. 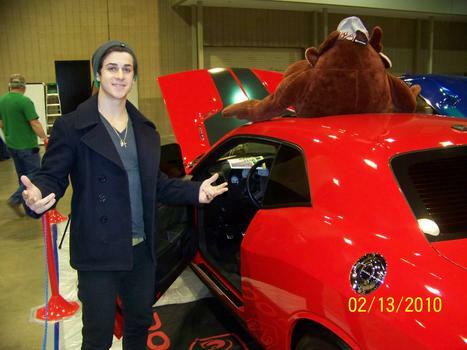 It turns out that one of the stars of Disneys Wizards of Waverly Place Robert Henrie (Justin) also owns a 2010 Challenger. He stopped by for about 20 minutes to talk challenger with me. We had little kids flocking around wondering why "Justin" was talking about cars and not to them. It just goes to show you that there are car guys everywhere. 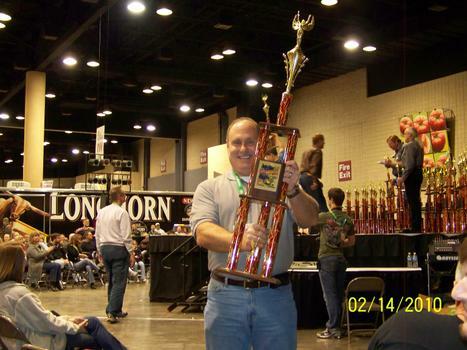 This is what you receive when you win 1st in Class at the 2010 World of Wheels at the Birmingham, AL BJCC. The trophy is as tall as my daughter. We also won for outstanding club display. 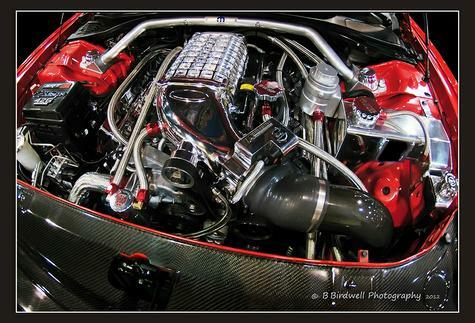 Billet Tech polished catch can, helps keep oil mist from the PCV out of the intake manifold. That and it looks cool too. Here is my best 1/4 mile run so far. 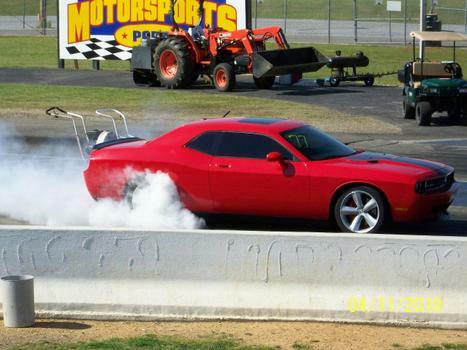 Once I get the launch down and get beter tires, 11 second QTR mile runs are very possible. 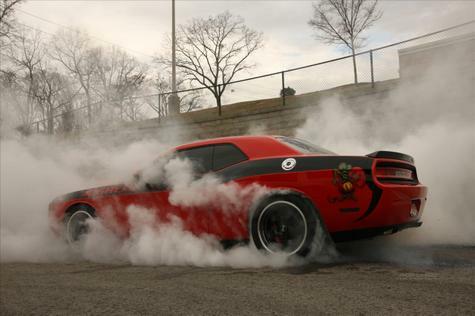 This is the PROPER WAY to drive a Dodge Challenger. 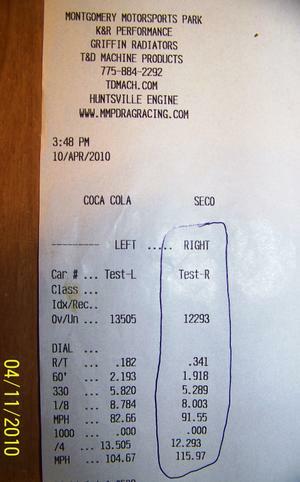 Here is one of my dyno runs. I hope the sound comes through. This is my dream car!!! It's absolutely gorgeous! Love your ride dude. 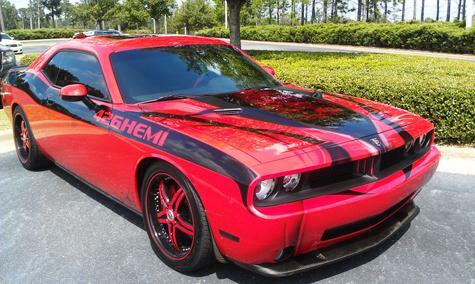 I just bought a 2009 Challenger srt8, looking to mod. 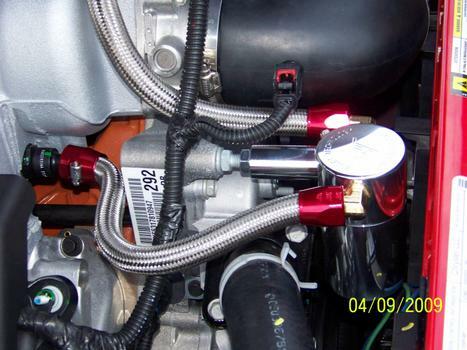 Can you tell me where and what the 85mm throttle body upgrade is as well as the steel braded lines. 85mm throttle body from Modern Muscle. Not much in the way of HP improvements, BUT, driveability and throttle response greatly improved. Steel braided lines from BMC Performance. Where Did you get those wire loom? Do they come in different colors? Nice! Ill be sure to get one but with a different color. I did not know you could buy a new car from a dealer and win a first place trophy at a contest. Amazing! You can not buy the car and win a trophy. First you need to invest countless hours replacing suspension components, brakes, exhaust, intake strut towers, add carbon fiber, change throttle bodies, upgrade ignition, add polished billet tanks, add a line lock and nitrous, make sure that everything looks like the factory would have installed it, add braided hoses and a billet water neck along with a lower temp thermostat, have a good dyno tune, and then spend around 32 hours working the paint until it looks like glass. THEN enter in a show. Go easy Heavymetal. 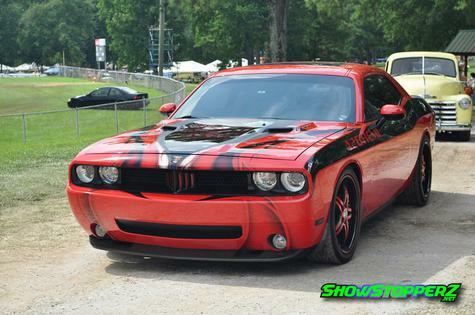 I get your point about buying a new car and entering it in a show as you bought it, but that's not what Snakepitt did. As he points out, he made his new school ride "his" with the work he did on it. 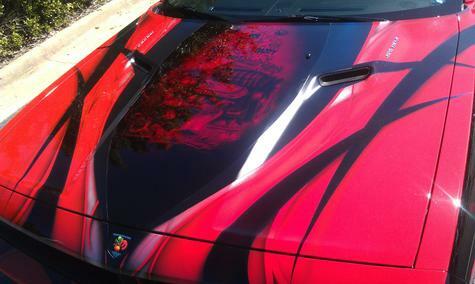 Snakepitt is no stranger to old school muscle - check out his sweet '68 Firebird (look just under "Related" above). Привет с Киева! Прикольные девчонки! "Hello from Kiev! Cool girls!" The 2 modern muscles standin next to that Charger ain't too shabby either, theye'd make the needle on a heart mach dyno. twist off!! Awesome ride very nicely done ! It is important to go where the ladies are. Rad ride. The ladies are quite the treat as well. Smokin!